Water felting is fun, easy, and these acorns make wonderful autumn decorations. 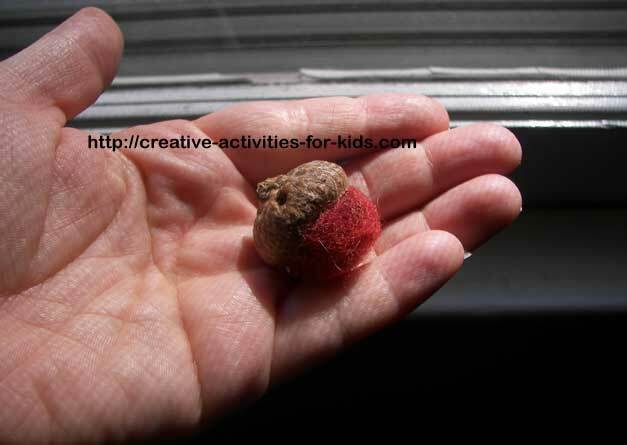 Making felted acorns are a great way to try felting Have you ever accidentally shrunk a wool sweater in the wash? Then you have felted before!. This is a wonderful tactile experience for your children! Water felting is extremely easy, and really fun. Fill bowl halfway with warm water, add a small amount of the dishsoap and mix it in the water. Plunge it in the warm soapy water and be sure it is totally wet. Now form the wool into a ball in your hand. Add one drop of dish washing soap onto the ball, and roll in your hands like you are molding some clay or dough into a ball. Continue dunking and rolling the ball until it is firm, and the desired size. This will take a couple minutes. When you are done and it is the size you like place it on a towel and let it dry. Continue until you have enough balls. Once the balls are dry glue them to the acorn caps using craft glue, or a hot glue gun. Adult supervision is required if using the hot glue gun. Use your acorns as decorations for autumn, on your nature table or as seasonal gifts! 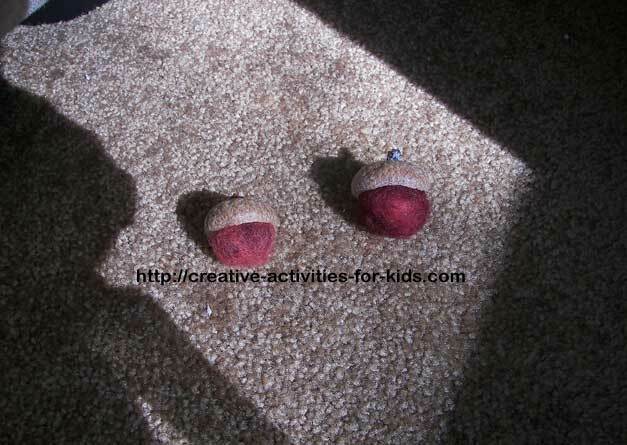 Did you like making the felted acorns? Want to try other fun projects?